There will be stocks at the Kings Arms on August Bank Holiday at the Old English Fete at the Kings Arms in Arundel. There are also, quite surprisingly, so far unsold stocks of a rather good book called The Valbonne Monologues, written by someone you and I have come to know and love. Me. So, with the editing mode between brain and mouth firmly fixed in the “off” position, I have inadvertently come up with a cunning plan to lower my own stocks which found immediate favour with That Nice Lady Decorator. “What about going into the stocks myself, getting people to buy a book for £10 and donating £5 from each sale to the Arundel Festival?” I said and almost as soon as the unedited thought escaped my mouth, in fact before I could eliminate it completely, it was in the public domain and I feel a bit of a shellacking could be in prospect. Brain to mouth; “shut up”. It was in the Swan Hotel, to which we had escaped for an early doors pint, the Decorating one to escape the paint fumes from her err… decorating and me to escape the pressure cooker atmosphere surrounding the good offices of Currencies Direct, that I set and then sprang my own trap, as in failing to keep ones traps shut. The lovely Rachel, the organiser of the fete was there and thanking me for arranging for old pal and shortly, no doubt to be BAFTA nominated thespian, due to the success of his film Otway the Movie, to open the said fete. It was here that I was told about the stocks, which are being fabricated as I speak by Terribly Tall Timothy Taylor. So unless the whole idea is forgotten, or, far more likely, will be deemed uncommercial, then it may well be a spell in the stocks for me in August. So you see I am torn. It is a double-edged sword. On the one hand, I will do anything for a sale, but I must say there is a remarkable lack of allure in the prospect being hit in the face with a rotten tomato. To paraphrase Meatloaf “I would do anything for (the) love (of literature) but I won’t do that”. On the other hand, now just 4 sales from break even, and the prospect of becoming an even more successful author as a result, well, what would any self-disrespecting writer do? Why start collecting rotten fruit of course! 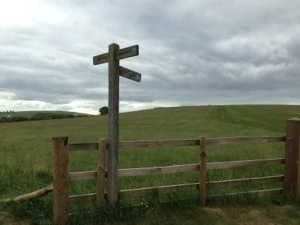 Earlier, I had continued my walking fitness programme with another 6 mile walk into the high South Downs, where, as you can see from today’s photograph, the weather that was on display at Wimbledon yesterday had certainly not extended as far south as Arundel. Which way is France? Is that a sign pointing towards sunshine and warmer weather? I shall not be unhappy to be able to pack away my hoody (as co-founder and owner of an award-winning rap and hip hop record label, Music of Life, I wear a hoody when walking in a show of solidarity with our artists and of course to keep warm in an English summer). By the time you are reading this, I will be in starvation mode, the penultimate diet day before leaving for our summer holiday in France. You will know by now that when I say holiday, I mean working holiday. We shall be on the ferry to Caen from Portsmouth on Sunday morning, bright and early, with a full car, a spring in my heart, a suitcase full of shorts, a nice dog, a horrid dog and a Nice Lady Decorator. ← Delving into Six Mile Bottom? Here’s a thought. With Arundel being a prosperous area full affluent middle class types with conscience’s in desperate need of salving, why don’t you charge £15 per book with £5 going to charity and you going into the stocks or £10 but no stocks. You don’t lose any money and you can guilt trip the punters into handing over the higher sum. Win win if you ask me. Of course I should of highlighted that no money goes to charity in the £10 scenario. The Arundel festival is a charity I think…. O.K. a smaller sum goes to charity for a £10 book and no stocks. Still reckon a lot of people would pay the larger amount just for the fun of tomatoing (!) you and the warm glow of giving a nice donation to charity. Halving your potential profit AND going into the stocks sounds like a lose lose situation to me !